Seeing the void left by the mainstream media, Meck J Minnala, a resident of Lae had taken upon himself to keep people, including media personnel from PNG and Australia regularly updated on the details of happenings since the outbreak of the violence in Lae, Morobe Province last Thursday (3/11/2011). This is his take on the whole affair. Since the riot in Lae city on Friday 4th November 2011 at least six people are dead and another 15 nursing wounds in the hospital. Numerous properties, values yet to be determined, have been looted and innocent families displaced because of house being burnt down by rioters. Other city residents were struck with fear of unpredictability and families went without a meal or two as the business and other activities in Lae came to a stand still. In online social networks, like Facebook, users were anxious to know what was going. There were some naming and shaming and other criticisms and even discriminatory comments going on based and whatever information each one had. Nobody can be blamed for their comments because everyone was trying to add meaning to what they perceived through the actions and reports of the riots. For those up us who grew up in Lae in the early 80s and former years enough to see the glory of the city in its hay days – it is a heartbreaking recollection. What follow is my recollection and reflections on how this riot in Lae got out of hand? How these six precious lives that we lost, numerous injuries plus the loss of properties could have been avoided. Nobody deserved to die. This and other associated issues were manageable. 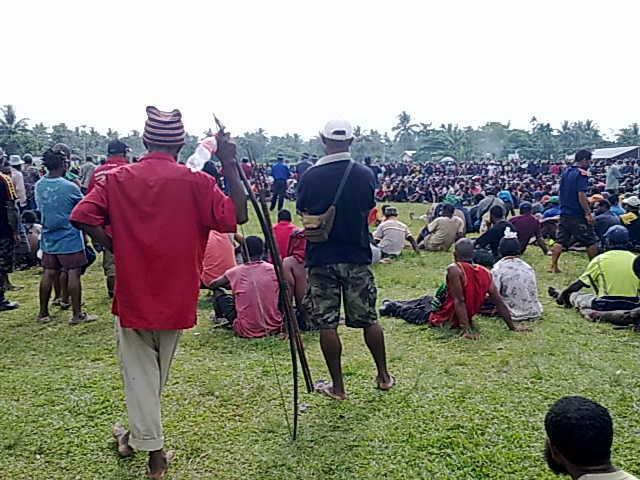 When almost a thousand Morobean youths gathered at the Morobe Provincial Admin (Tutumang) to petition the provincial administration/government they had the following four main points for the Morobe Provincial Government (MPG) to address as a matter of priority. Lae city Authority Manager to be sacked for giving contracts to outsiders and not Morobeans. Highlands PMV bus stop at Eriku to move to 9mile. No more street selling in the city as it only breeds criminal activities. Point #1: The Morobeans have for so long been spectators in their own land. This group felt they needed to play an active role in the development of their provincial capital. At the moment, less than 5% of the people working in the city council are Morobeans. I have observed and it is true that the City Council has not been considerate in awarding of contracts. For example: Ahi Construction was denied any civil contract in the recent multi-million kina Lae city road infrastructure redevelopment project. If any (subject to my limited knowledge) the city council restricted the city’s taxi service licensing to strictly Morobeans (only those clans within Lae city) but how good is it when all basic transported is overly catered by the PMV bus services. The MPG and Lae City Council have failed to ensure a fair playing field in the development activities of Lae City. Point #2: The call for relocation of the Highland bus stop from Eriku to 9 mile is simply because it has become a nest for thuggery and uncontrolled lawlessness. This is simply because of lack of routine and consistent surveillance of the area by the Police. Menyama Security Service is not the statuary body mandated to oversee law and order – the Royal PNG Constabulary (POLICE) is. Even if we had only 270 police personells manning the city what you need is at least 5 cops doing routine patrols consistently at major commercial areas and bus stops. This request was another way of simply saying that the Police are not doing what they are supposed to be doing. Point #3: Their claim that street vendorsim was breeding lawlessness and lack of respect for fellow human is true. And this is compounded by the lack of police surveillance. Ten years ago we may have seen a couple of bettle nuts and cigarette sellers on the streets or bus stops but they were never pestering and at least respectful of personal space. The new breed of street sellers that we have seen has turned the social outlook of all the main centres and bus stops in Lae upside down. And I have no reservation in claiming that these new breed of street vendors have been sponsored by the new breed of Asian business houses in Lae. This type of street vendorism is an old and usual practice in Asia (especially China and India) and has become quickly acculturated in PNG breeding societal pests. Lae was okay when we had only Papindo, Seeto Kui and Pelgens, but when the flood gates were opened for the Yings, Zings, Quinx, Lings and Jengs came, they took advantage of the unfortunate circumstances of the unemployment youths and turned them into societal pests. Being taken advantage of is a painful secret punch and culturally rude. Other chain of unlawful activities followed. Though this street vendor activities took a piggy back ride on Lady Kidu’s informal sector arguments but my opinion is that unless it can be properly strategized and managed, it is not worth permitting in PNG, more so Lae city. Point#4: Land corruption deals are not a new allegation but something that has been on ongoing issue in PNG. The Morobeans have every reason to belief that their land has been traded for greed and the MPG did nothing to interceded let alone address it. Land disputes are always fuelled by poor governance. One such example is the dispute over the ownership of the land along the old Lae Airstrip which was never purchased buy the state at any one time but currently a certain business entity of non-Morobe origin is collecting lump sum rentals for use as lay-down area for the LNG project. The petition was intended to be submitted on Thursday 3rd November but even though the old governor and the provincial administrator were made aware of it they chose not to turn up and receive it at the Tutumang although they were in Lae city at that time. The mobs got frustrated and physically attacked deputy governor and the deputy administrator inflicting injuries on them. Some looting and demolition where also done. The mobs demanded that the governor and provincial administration be there to address them the next day. On Friday morning, the governor ( Luther Wenge) and the provincial administrator were there as requested. When receiving the petition they did not make a reasonable undertaking consistent with the petition for the youths to fully digest. The media in PNG was very audible in inhuman activities in Lae, especially at Eriku bus stop, in the days leading up to this petitioning. Instead the best Wenge did was quickly saying that he will put the provincial administrator to task to address their points in the petition and he was preaching about provincial autonomy and added more emphasis on inviting all those youths gathered to come on the 25th November to put their mark on a MOA requesting for Morobe to get provincial autonomy. What I don’t understand is whether the youths were there to fight for provincial autonomy or get the MPG to make a tangible commitment to the points raised in the petition? What frustrated the youths more was not the points they raise in the petition but the lack of competence and strategic leadership demonstrated to them on that particular day. The manner in which the crowd was received and dealt with by the MPG sparked the riot – driving the Morobean youths nuts. The petition had genuine points and every reasonable citizen/resident of Lae city emphasize with it. But the way on which they were received made the crowd did things that infer regionalism but they were only trying to get the attention of the PEC (if not NEC too). They were only trying to show how serious the issues are. Aren’t these issues the same issues affecting other citizen and visitors elsewhere in PNG? Thinking Papua New Guineans should by now realise that unchecked abuses of political power has endemically undermine growth and development in PNG. The uncompromised rule of law is also an essential precondition for a prosperous economy organised on market principles. The rule of law not only ensures life and personal security, it also provides a stable framework of rights and obligations which can help to reduce political risk to investors and to cut down transaction costs. Am I the only PNGean starting to think that the rule of law in PNG has been segregated, privatised and abused? Lawlessness and unemployment related issues in PNG can also be attributed to all the failed reforms that we have been forever piloting with ambiguous destinations. Ours is a cycle of getting exited of one thing and kicking it out (or shelving it) the next minute like kids collecting sea shells. What’s wrong with the cockpit? What we have witnessed in Lae is this weekend is a revelational effect of the endemic poor leadership, systematic and systemic corruption and permitted lawlessness in PNG. WHAT DID YOU EXPECT? Something less? No time to beat around the bush. Our mandated leaders and bureaucrats in positions of trust have been too busy accumulating wealth in corrupt and selfish manners and the majority of people have put up with it for so long. What we experienced in Lae is the tip of the ice-berg. Our existing, as well as emerging, challenges are complex and will require long-term investments in capacity building and the conditions to deliver broad based, sustainable growth or at least the highest possible levels of self-reliance. Otherwise we could be on the same road that some of these failed African countries have travelled. Unless the government comes up with good strategic plans for city developments, good governance and good law and order, we are likely to see more riots like this. The systematic corruption in PNG needs to be seriously weeded out too with impartial powers and sufficient resources given to law enforcing agencies. Improved governance in our cases depends on the willingness of provincial governments and national government plus development partners to work collectively to address shared problems. We as people also need to be very selective in the type of political leaders we select in the next election in 2012. Forget this age old system of voting people during the polls based on tribal alliances or in exchange for goods and favours. PNG needs to make real decisions or else we are at risk of loosing promising investors. In the meantime we the residents of Lae await the outcomes of the PEC and NEC meetings hoping that they will possibly strategize some lasting solutions to restore normalcy in Lae City once and for all. God already blessed with abundance of natural resources. My HE also helps us to manage them in wise and fair ways to the benefit of everyone. God bless PNG. Note: Please note these reflections are based on my personal observation and I do not take responsibly for how it is consumed. Thank You Meck. Spot on!!!! Thanks for your on the spot views of the “rioting”. Our national paper “The Australian”, which is really not so much a newspaper but a more a business propaganda rag has reported that the riots are merely lawless youth gangs roaming the streets and threatening the PNG resource boom. Well put, Meck. Having been part of the sub-chapter of Transparency International -Morobe, every effort was made to give opportunity to the people of Morobe, esp the Youth to vote better leaders to make a difference. Perhaps next election the people will choose more responsible effective leaders who have their people’s concerns at heart. We can only hope! Up to you all now to look closely at the future and make better choices… Our hearts go to those who have lost family in the perish. Something good has to come out of this. God bless all! Oops, i didn’t even see this repost until today. Looking at things now and compared to then, not much has changed. If not the thuggery and lawless in main bus stops is still prevalent. If preventative actions are not established in a timely manner manner then we might see another mayhem more worse then the previous one in 2011.